Writing collaborative papers is never easy. On one hand, you’ve got a range of ideas, expertise, and disciplinary approaches to account for; on the other hand, (and sometimes less reported) you have different personalities, working styles, and levels of seniority to negotiate with and draw from. Some people like tables, others prefer flowcharts; some like detailed methodological sections, others want more focus on policy implications. And so on. In December 2016, the ASSAR India team had their quarterly team meeting in scenic Kotagiri, at the campus of Keystone Foundation (an NGO both IIHS and ATREE collaborate with on other projects). The meeting was structured differently than usual update meetings – the focus was on peer-learning and brainstorming on synthesis products. Armed with blackboards and glorious weather, we broke into thematic groups (Social Differentiation and Gender; Governance; Dynamics of Ecosystems Services; Governance) and spent half a day discussing possible opportunities of synthesis at an India level: who’d be interested in doing what, the potential messages each output would have, and intended audiences for them. Fuelled by locally-grown organic food and with the breathtaking Niligiri Hills as a backdrop, ideas flew fast and plentiful. Brainstorming on synthesis ideas in Kotagiri at the quarterly ASSAR India Meeting in December 2016. And then we were back in our offices. Our daily life of deadlines sucked us in completely and those eager blackboard jottings lay undisturbed. In June, Amir Bazaz (Research Lead, India Team) asked us to revisit pictures from those blackboards and take stock of our synthesis outputs. Retrospect and a relook at ASSAR’s framing questions (of scaling, barriers and enablers, and effective adaptation) helped us shorten the initial wish list and we ended up with two key areas of synthesis: drivers of vulnerability and barriers and enablers to adaptation in semi-arid India; and examining vulnerability through a wellbeing lens. A few emails later, we set up smaller working groups with people self-selecting into the teams based on interest, familiarity with the data, and available time. Outlines were drawn up, initial thoughts put down. Things were moving! Here, I’ll discuss our experiences on collaborative writing on the topic of Drivers of vulnerability and barriers and enablers to adaptation in semi-arid India. Having a self-selected group of authors from the start helped, but being in different locations meant that progress was slow. We had a couple of Skype calls to discuss the conceptual underpinnings of the paper and set up a shared folder to share literature. 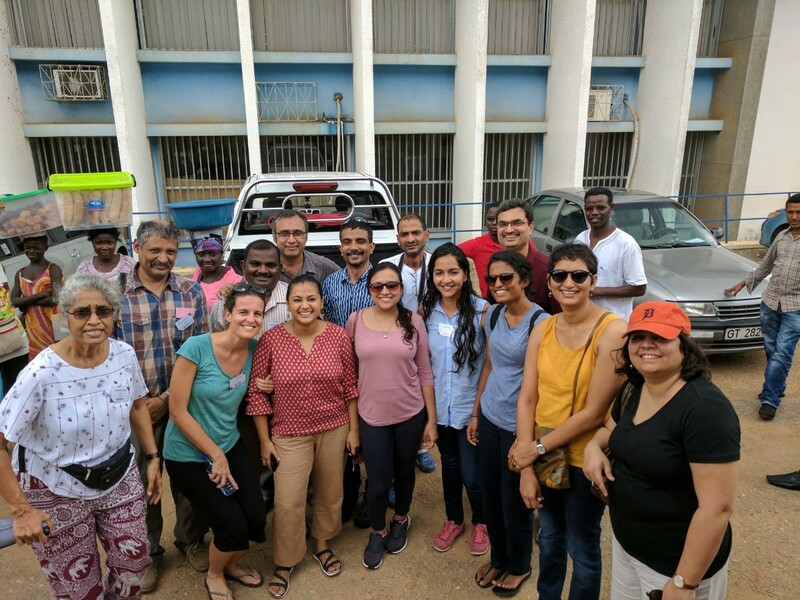 The next time we met was at the ASSAR Annual Meeting in Ghana (July 2017) where those working on the paper from ATREE, WOTR and IIHS revisited the paper outline. Based on past readings, we discussed whether we could apply Eakin et al.’s framing of specific vs generic capacities to our empirical evidence on risks and responses in semi-arid India. This was challenging, given our different disciplinary backgrounds and strengths in research and practice. Ramkumar Bendapudi brought in insights from how development and adaptation are intertwined at the local level; Divya Solomon highlighted the new vulnerability literature she’d been reading. We discussed enlisting co-authors to help with the literature review, and most importantly, agree on some not-too-distant deadlines. We made good progress in those few hours and aimed to have a draft paper by October. The Annual Meeting in Ghana (July 2017) was a good opportunity for the India team (spread over three locations) to meet and continue discussing commonalities and differences in our evidence across the three sites (Maharashtra, Karnataka, and Tamil Nadu) we are studying. And then, yet again, daily life and its numerous demands meant we didn’t meet deadlines. We did write out case descriptions and initial findings but the paper wasn’t coherent. One day, I had a brainwave. The year before, my colleagues Kavya Michael and Tanvi Deshpande had participated in a writeshop Gina Ziervogel (ASSAR colleague and Associate Professor at UCT) had organised during their Small Opportunities Grant visit in Cape Town. They had found the experience invigorating and I remembered wanting to ‘apply’ the writeshop method and test it. Maybe this would rejuvenate our languishing paper?! Amir backed the idea immediately and enthusiastically and after a flurry of emails, we’d fixed on mid-November. Having dedicated time blocked for the paper and a clear agenda for the writeshop motivated everyone to relook at their cases. Over a Sunday and Monday, the five of us, sat down to an intense two days of writing. The writeshop motivated everyone to finish up their case narratives beforehand, and even re-read Eakin’s paper in preparation. I drew up a daunting (and somewhat overambitious) agenda for the writeshop; Soundarya Iyer chipped in to organise all the logistics, apart from contributing to the writing process. At the end of two days, we had a long and messy draft of about 9000 words. We still had a long way to go in terms of sharpening the argument, situating it theoretically, and highlighting our key conceptual, empirical, and policy contributions, but at least we had a draft! We went away with a new (predictably ambitious) set of deadlines and clearly defined roles. Of course, in keeping with tradition, we are back to our offices and dealing with more pressing deadlines first, but in my view, the writeshop was pivotal for the paper. It helped us agree on what we want to say and how. It helped us draw up tentative figures and populate stubborn tables. It placed us in a position to have a clear draft to work with, each understanding where we contribute. It helped us draw on each person’s unique set of experience and expertise, making the final text truly collaborative. And most importantly, it helped us reconnect again, on a personal, humane level – so important for large teams spread across organisations and working remotely. 10 am to 8 pm! The two-day writeshop was an intense, tiring period of involved discussions, blocks of writing time, failing to draw on a 2D frame all the fascinating detail we’d captured in the field, and long, restorative lunches. To Eakin or not to Eakin? Trying to populate Eakin et al.’s (2014) grid on generic and specific capacities. The messiness of coproduction and synthesis – a table on barriers and enablers of adaptation. This blog was written by Chandni Singh, Indian Institute for Human Settlements, with inputs from Amir Bazaz. Research being undertaken by ASSAR's East Africa team is underlining the interconnected nature of environmental and social dynamics in semi-arid regions. Read more about it in this detailed report. ASSAR, in collaboration with CSIRO (Commonwealth Scientific and Industrial Research Organisation), organised a webinar on Adaptation Pathways on Friday 14 October 2016, available online here. Drawing on information gathered during the RDS our India team explores the effects of climate change on Bangalore in this exciting video.